Anne drove home last evening. 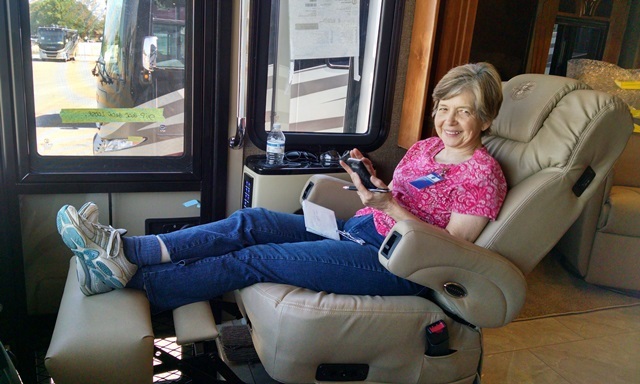 She needed a break and wanted to be in Red Bay with Max for the final inspection of our new motor home. So, it was up at 3:00am to make the Red Bay drive to be there at 6:00 for the start of the Tiffin work day. Max has been doing this almost daily for the past two weeks. While Anne has been busy with family emergencies, Max has been insuring the best build we can get. It was just so great for us to get to spend the day together and once again today do a joint blog post. We do so much better together. 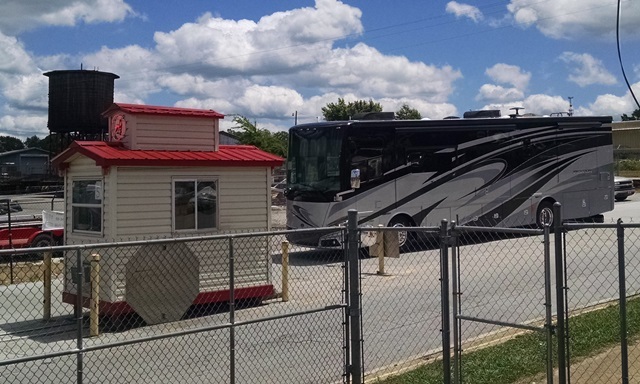 The new RV is looking really good. We are so pleased and excited. We watched as they performed the final cleanup, and touchups, talking to the Tiffin employees and continuing to learn about our new coach and ways to best care for and touch up little “mishaps” that will inevitably happen. 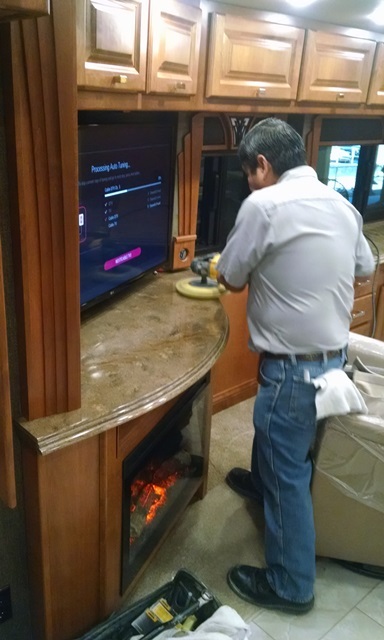 These guys know how to touch up the marble, the wood, the dash. Really amazing. Today we also had the real treat of meeting with Bob Tiffin. We asked at the office if we could speak to him and the receptionist said sure, as soon as he gets off the phone. So, a few minutes later we were escorted to his office for a brief visit. We simply wanted to thank him for generously allowing us to view the entire build of our motor home and interact so freely with the employees. What a wonderful experience this has been. We have met some of the nicest people and seen them take great pride in their work. We so glad we were able to express our gratitude to Mr. Bob. Our new rig is now back in Belmont for the little paint repairs we mentioned in the last post. They expected to finish that up tonight and have it in line for delivery by early tomorrow morning. 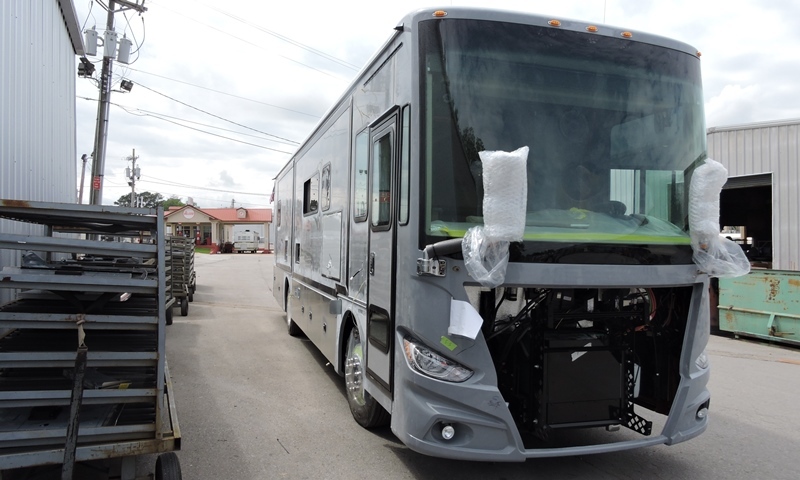 There will be paperwork to complete and then a driver will make the delivery to our dealer Sherman RV in Sherman, Mississippi. YEA!! Just a few more days. For those of you who are also walking through the hard times our families are experiencing. Anne’s Mom was transferred to Health South Rehab Hospital in Newnan, GA this afternoon. This will begin a week or two of acute care rehab before her return to Tuscaloosa for continued care. She made the trip in great shape and will now start the hard work of rehab. Marguerite continues to loose the battle of ovarian cancer. It is such a struggle for she and Jim. So very hard but we will continue to walk through this “valley of the shadow of death” with the two of them. Thank you all so much for your prayers. They are felt and greatly appreciated. 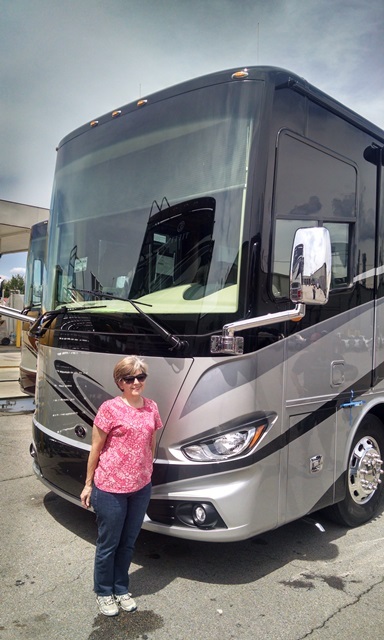 Max: I have been to the Tiffin Motorhome facilities in Belmont, Mississippi and Red Bay, Alabama every day since the last blog entry to watch the new motorhome being built. It’s very interesting to see how it is done and gives me a better knowledge of the inner workings of the coach. It also gave me a chance to have a few things changed and a few things fixed earlier in the process. The most significant repair was the replacement of a fender that was not installed to the supervisor’s liking. That probably cost us half a day, but it would have cost us a couple of days if we waited until the motorhome was completed. 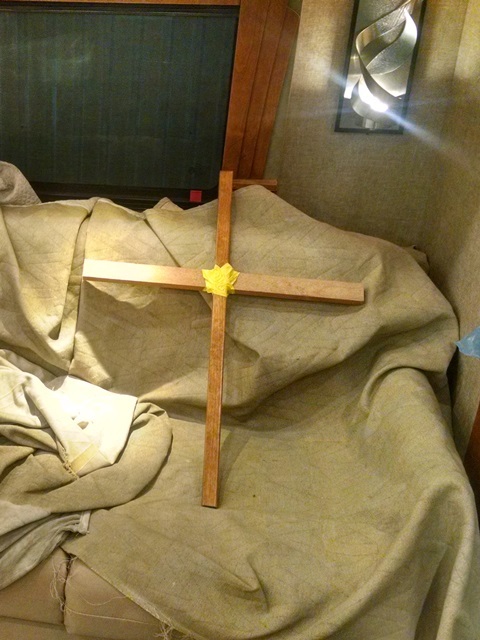 On Wednesday, when I arrived back at Belmont I found someone had left a wooden cross made of scrap wood and painters tape on the couch. We don’t know for sure but we think it might be from one of the several workers we talked to about our NOMADS work. At least that is what we will go with unless we find out differently. With the painting finished the coach was taken into the rain booth to check for leaks. In that test it is pulled into a closed bay and sprayed from all directions with streams of water. The technician said they pumped about 500 gallon per minute during the test. There is another leak test called the bubble test. 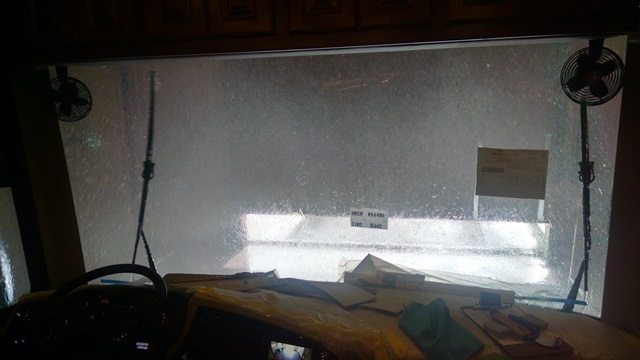 In that test they wet down the unit with a mild soap solution, they over-pressurize it with a blower attached in the driver window. They then look around for bubbles in places where there should be no bubbles. During the inspection following the rain booth, one of supervisors found the fender problem and decided to have it replaced. Since that was going to take the rest of the day, I headed back home about 11 am. 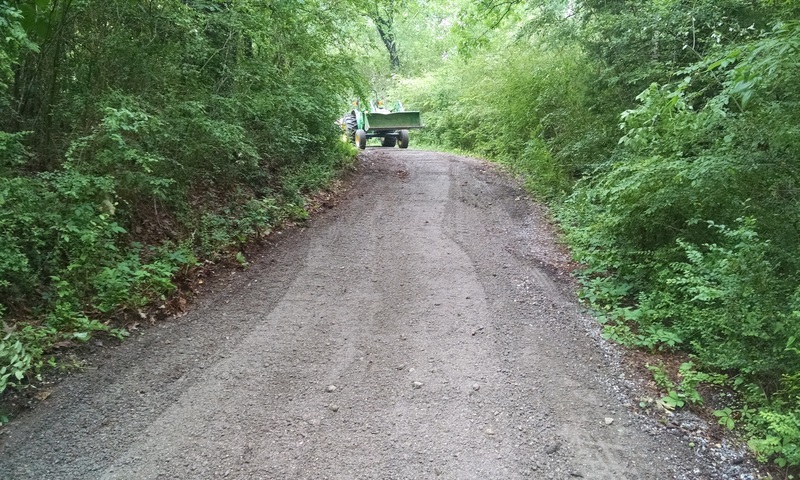 Back at home it was time to repair the driveway again since my nephew and niece were coming to spend a couple of nights at the house while visiting my mother and others. 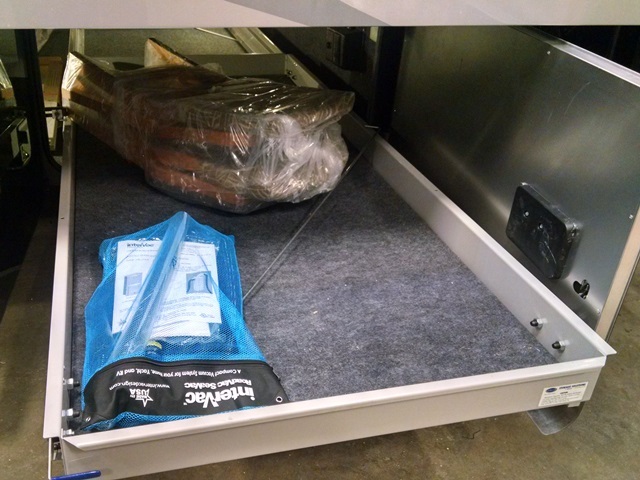 Today, all of the final pieces were installed – the remaining cabinet doors, electronics and the navigator chair. Again, it was good to be here to learn about the systems and to point out things that needed fixing. Everyone I have encountered has been very friendly and willing to answer questions and share their knowledge. Also, every employee acts as an inspector. If they find something they don’t think is right they flag it or call someone to fix it. After all the parts were in place the unit was moved to the cleanup line outside. While there it is inspected again in the sunlight. One of the inspectors told me that there had been discussions about building a covered pavilion for the cleanup, but Bob Tiffin nixed that idea by reminding everyone that motorhomes spent most of their time outside so they need to be inspected outside. At the end of the day, much of the cleaning had been done and the inspector found a couple of paint runs that showed up in the sunlight. So Tuesday, after the cleaning and inside inspection/corrections are finished, it’s back to Belmont. Anne: I am still in Atlanta. Mother could not have surgery Wednesday as we had hoped. She was in the operating room holding area when the doctor decided to check her blood one last time and discovered one of the tests was too high and he would not operate. So back to the room we went with everyone feeling very bummed because we were ready emotionally to get it done. But also feeling very blessed that the surgeon was very careful and would not take any chances. Our surgeon was not available on Thursday so today was the day. Oh my goodness. God has really taken care of my Mom! We had a different anesthesiologist today who decided on a different game plan considering Mom’s age and pulmonary hypertension and the fact that her blood was no longer too thin. She wanted to avoid general anesthesia due to concerns about being able to get Mom off the ventilator once they put her on for surgery. Therefore, she felt she could place blocks in her leg that would allow for the surgery. She did the blocks, a femoral and a popliteal block, the surgeon did the surgery, and Mom came back to the room awake and with no post-anesthesia nausea and vomiting because she had only some light sedation. It was pretty amazing. She was wanting to get out of the bed and start her rehab this afternoon. Of course she could not do that and is still on bed rest probably until tomorrow sometime because all the feeling has to come back in the leg. She has started to have some pain now but they are controlling that with pain meds but wow! She is doing so well! God is good!!! Thank you everyone who as been praying for her and our entire family. Max: I drove to Red Bay again today to check on the status of our new motorhome being built there. But it wasn’t there. The nice security officers tracked it down to the paint facility in Belmont, Mississippi which is just across the state line from Red Bay. The nice security officer in Belmont pointed me in the direction he thought it would be. But it wasn’t there. 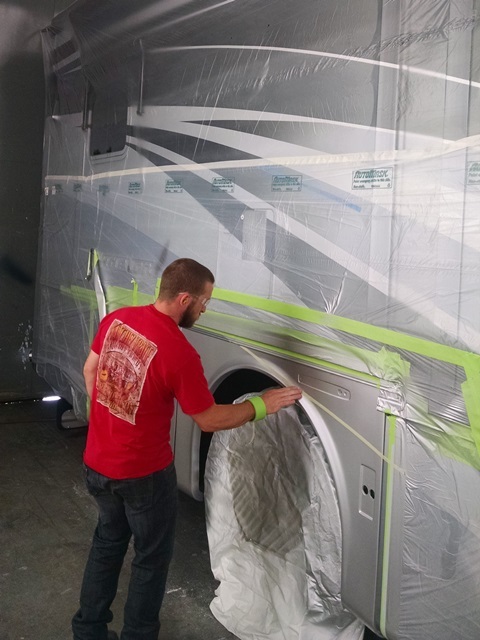 After I walked through the areas it was scheduled to be today and returned to the security office we found out it was in one of large paint booths on the “paint repair line”. 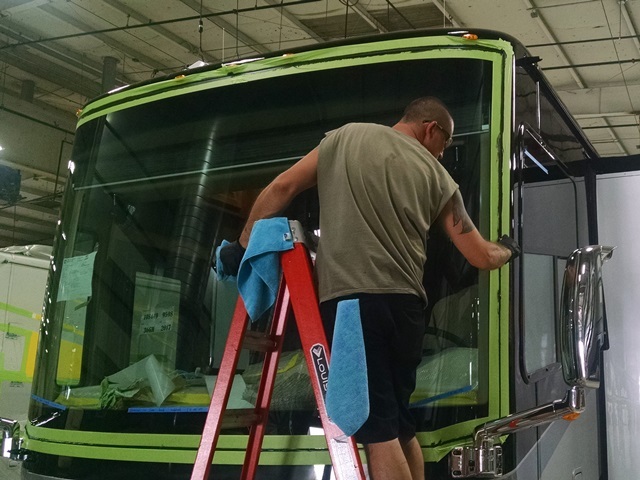 After all that I was able to stay with it the rest of the day and watch the workers touch up paint defects (some of which I couldn’t even see), apply the brand decals and seal the windshield. Another interesting day. According to the schedule, tomorrow it should have the final sealing and rain test then return to Red Bay for final inspection and the installation of the items that go in after painting. 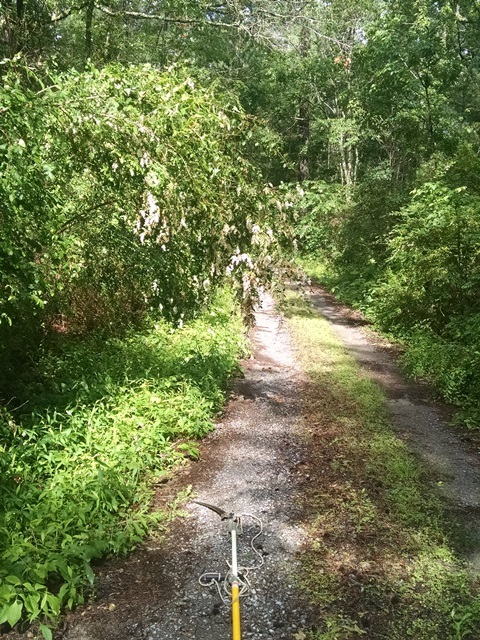 On returning home, I found there had been a storm here, the driveway had washed again and the power was off. It still is as I write this. Anne: No pictures for me, just an update for those of you that don’t know what’s been happening. Currently I am in Atlanta with my Mom. Last Saturday Max and I returned from South Carolina as far as Atlanta. We stayed with Marguerite while Jim drove to meet my other brother who was bringing my Mom from Tuscaloosa with plans for Mom to sit with Marguerite this week so Jim could take care of some business. Max and I left Jim’s about 5:45 Sunday morning with intentions of being in Oneonta in time for church and Sunday School. However….. Semper Gumby. We were between Ashville and Oneonta when I received a call from my brother Jim. Mom had fallen when she got out of bed, so instead of continuing to Oneonta, we went home and I gathered a few clothes and immediately returned to Atlanta. Long story short, Mom had a light stroke, and fell, breaking both bones in the lower leg just as they join the ankle. Her speech, once slurred, has returned to normal, but she still has some balance problems and slight weakness in left hand, arm and leg. Hopefully tomorrow she will have surgery to repair the breaks with screws and plates. She had to wait at least 48 hours after the stroke to get clearance from neurology for the surgery. We won’t know until about 6:00 am tomorrow if she has made the surgery schedule. If not, we will try for Thursday. So, for now we just ask for prayers for successful surgery and quick healing and strength to walk through these difficult times for our entire family. We are in between mission projects right now and dealing with some family situations that would probably not be very interesting to most of our readers. So, we will probably not be blogging for a few days. To make sure you get notified when we start again, look for the “Follow” button in the right hand column of this page. You can cancel the email notifications at any time. We are both blessed with still having our mother’s with us for another Mother’s Day. And we both got to see our mothers today, although Anne in Georgia and Max in Alabama. Anne: I am still in Atlanta with my brother Jim and his wife Marguerite who has ovarian cancer. My Mom has been here for the past week and it’s time for her to go back to Tuscaloosa. I will stay a few days to help Jim out with some cooking, cleaning, and care of Marguerite. It’s a blessing to get to spend some time with them and visit even though it’s under the lousy circumstances of cancer. Since I hadn’t seen Mom since we went to the Sumatanga project six weeks ago it was great to get to see her, too. Very grateful that I was able to be with my Mom on Mother’s Day. Really hate that I was unable to see Max’s mom today but at least he was able to see her. Marguerite had a really rough morning, but pain improved during the afternoon and we had a little time to visit when she was fairly comfortable. Taking it one day at a time. 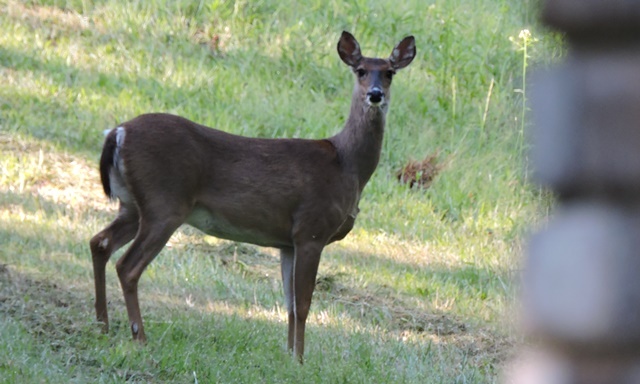 Max: As I was headed out the door to go to church I looked out through the garage door window and saw a doe standing just outside. I grabbed a camera and slipped out the back door. Using the corner of the house as a blind, I held the camera around the corner and snapped a few pictures. The deer heard the shutter and slowly walked away. By the time it was out of sight, three other does joined her and trotted over the hill. That is one of the joys of living in the country. Yesterday, while working on the back deck, I heard a familiar hum overhead and then some tiny chirps. 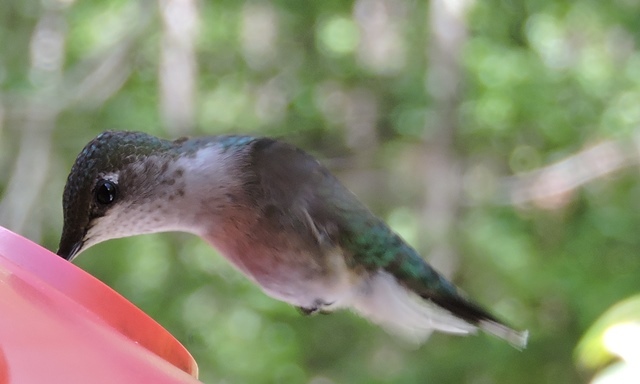 Someone was telling me it was time to put the hummingbird feeder back out. As soon as I did, a camera shy male came and checked it out and left. 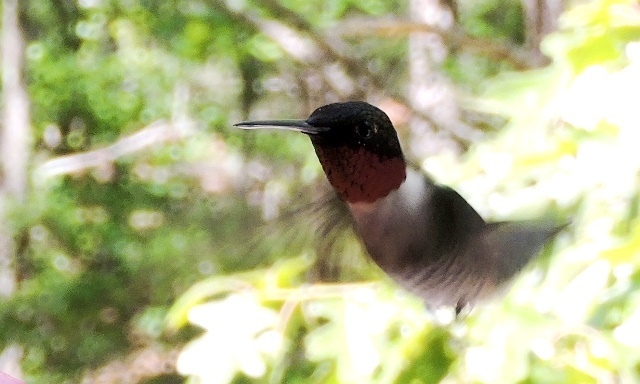 This afternoon there were several around the feeder so I was able to get a few pictures. 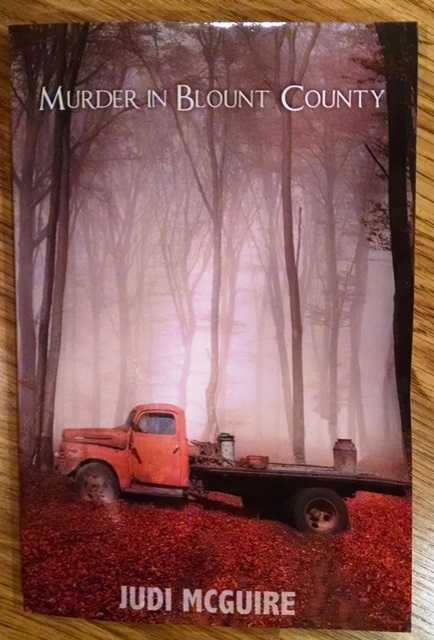 Later this evening I took Mother her card and gift, an autographed copy of Murder in Blount County by Judi McGuire. It is a fictional mystery based in our home county using names of people and places that we know. Of course, unknown to us, she had bought herself a copy on Wednesday when the author was at the Oneonta Public Library for a book signing. Anyway, it was good to see her (and my sister who was also visiting) and Mother appreciated the thought. Max’s mother has always had a green thumb as witnessed by these irises growing in her yard. Last night Anne received a call from her brother asking her to come to Senoia (Atlanta), Ga to help with Marguerite. Marguerite had taken another turn for the worse, was in a great deal of pain and Jim was having problems getting it under control. Anne left early this morning to drive over. She arrived safely and found things had improved a little over night. Marguerite is, as expected, continuing to decline. She is not yet in Hospice, but that may change the first of the week. Pain control is becoming more difficult. Please continue to pray for the entire family. 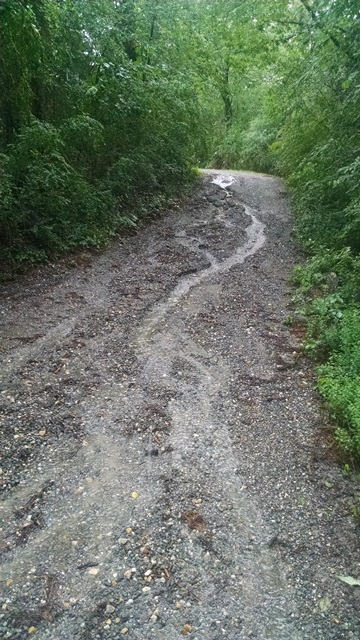 When we returned from North Carolina, our driveway had washed out some from the heavy rains while we were gone, then again yesterday while we were in Red Bay. 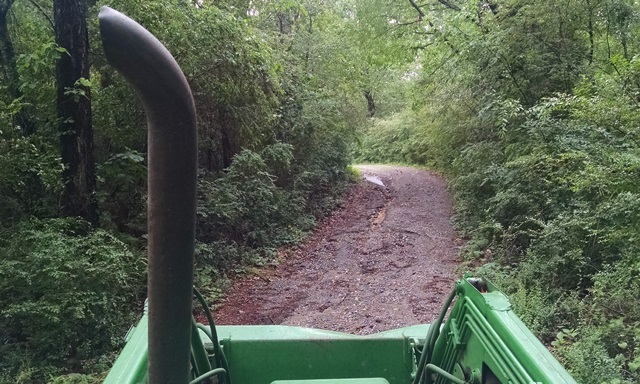 So, today Max’s priority was to get started making the driveway passable for a motorhome. 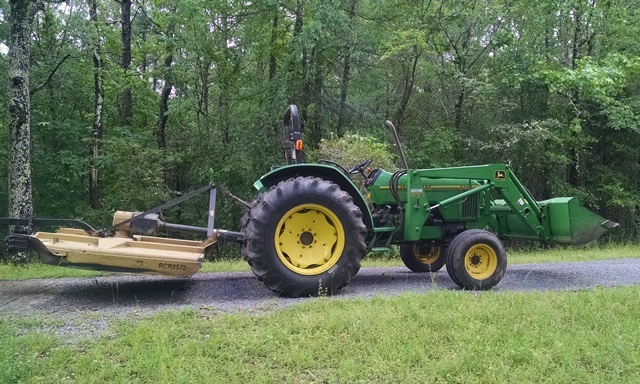 First he had to do some regular maintenance on the tractor and get it out of the basement without tearing up the back yard too much. Once that was done it only took a few hours to repair the washouts and mow back some of the privet hedge from the sides. There are still some limbs to cut before the new motorhome arrives, but at least now cars can get in and out without dragging and having limbs drag across them. Max also rode a few miles on his bicycle for the first time since his surgery. No problems and he enjoyed the ride to visit his mother. We got home about 7:30 last night and spent the next two hours unloading the truck. It was so packed that we were afraid to open any door without being ready to catch something that might fall out. We had somewhat underestimated the room it would take. Tuesday when we loaded out what we thought was a lot of our stuff we were feeling pretty good about getting everything home. Really thought there would be some extra space. NOT! We barely stuffed it all in yesterday afternoon. So now the sunroom and our bedroom are full of boxes and bags of FRED stuff. We packed so fast last week that we didn’t label anything and therefore will probably be looking for things for several weeks. Oh, well. Today we almost felt like we had gained a “free” day because it was suppose to be a travel day. So instead of staying home and working we decided to go play. 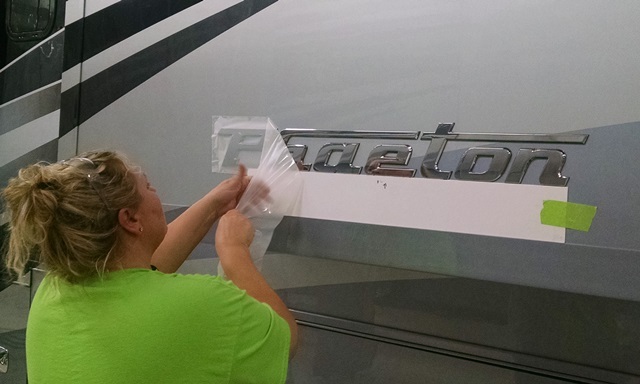 Tiffin Motorhomes in Red Bay, Alabama does something most manufacturers would not think of doing. 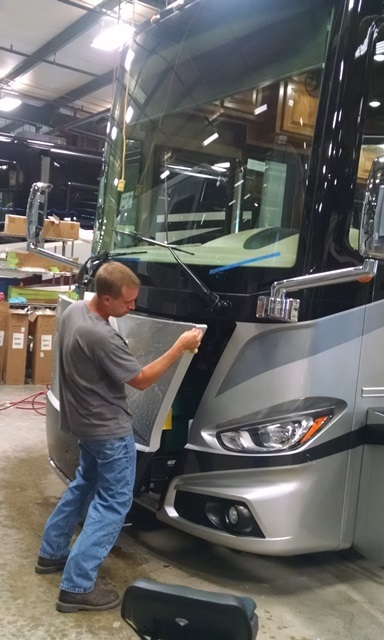 They allow you to follow your rig from the time it enters the factory until it is complete. 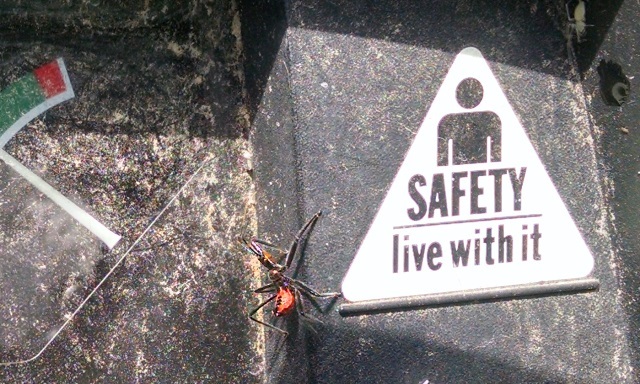 There are certain things you can’t do, like the welding shop, but for the most part very little is off limits. 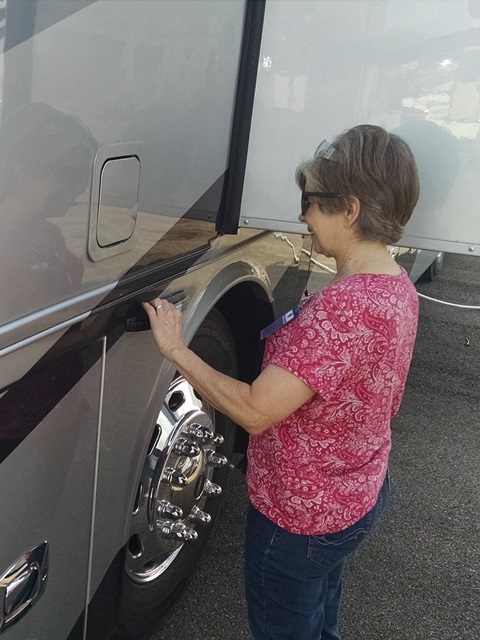 You can wander around, talk to the people working on your rig and ask questions, going in and out of the motor home as you please. Of course, you have to stay out of everyone’s way so they can work and stay out of the way of the delivery of parts to the rigs. We have the build schedule which gives the hour by hour schedule for our rig. Since our new motorhome started in the welding shop on Monday and into the main plant on Wednesday, we decided to make a road trip back to Red Bay. The work day at Tiffin starts at 6:00 and ends at 2:30. We didn’t make it there for the start of the workday since we had a two hour drive, but were there by about 6:30. After we checked in with security and received our badge and safety glasses, we had to go find our rig. We knew where it would enter the plant from previous visits, but there is more than one assembly line. We didn’t know exactly where our rig would be when we arrived. We knew our build number, 108449, and that that should be on the parts and rig, but where was it. There were so many rigs. We wandered around looking, looking. It was so exciting when we finally spotted “108449” on a rig right at the station listed on the build schedule. They were putting the large driver side slide in place when we first saw it. We are so glad we made the trip. 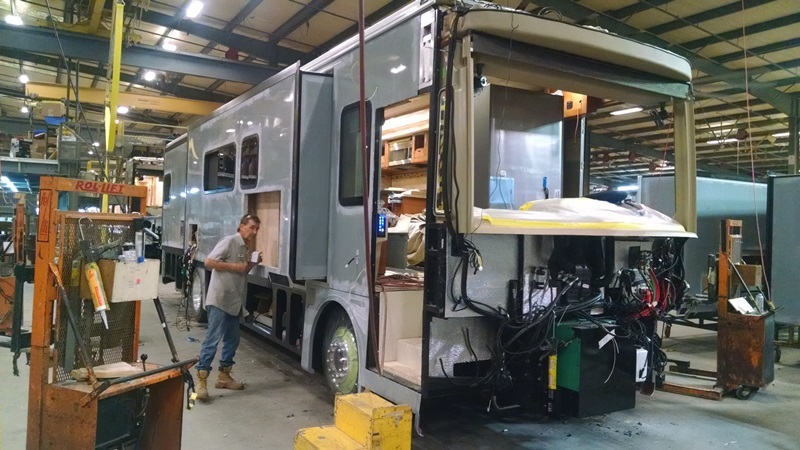 It was so fun to watch the building of our future RV. Everyone was very nice. They even gave us the extra pex and plumbing tubing so we have started our spare parts kit. Hope it was Ok for them to give it to us, but they were going to throw it away and when we asked they said “Sure you can have it. You’re paying for it.” They are about 1.5 to 2 hours behind schedule right now due to a problem further up the line. Hope they don’t get too far behind since we are on a pretty tight schedule. The employees seemed very conscientious. When the employees from Station 12 finished the rig they were working on they picked up their parts and tools and came back to Station 11 where we were and started doing what they could from there. The young lady said “I can’t stand to get behind and I don’t want to start Monday even further behind, so I just go to where the RV is.” As we talked to the workers, they asked questions about where we travel and what we do with our RV which allowed us to share the NOMADS story. Can’t help but think that as we talked and they got to know us a little, that maybe they were taking a little extra care of our new baby. It was just a really good day of time spent together not thinking of cancer. Now back to the real world of sorting and organizing and being responsible.